Kevin Harvick started fourth and finished first. Harvick took the lead for the first time on lap seven. The Jimmy John’s driver held the lead for the remainder of the stage. Following the end of the stage, Harvick came to pit road for four tires and fuel. An issue during the pit stop dropped the team to fifth on the ensuing restart. Started fifth and finished 10th. The 2014 Cup Series champion raced his way back up to third in the beginning of the stage. However, Harvick fell back after getting hung out on the bottom and finished the stage in 10th. Harvick came to pit road for four tires, air pressure, wedge and fuel at the end of the stage. Started eighth and finished first. Harvick raced up to fourth at the start of the stage, but he got stuck in the middle with no help and eventually fell back to ninth. The Jimmy John’s driver found himself seventh when the caution flew on lap 55. He came to pit road on lap 57 and restarted 15th. After running just inside the top-10, Harvick stayed out on the lap-70 caution, which advanced him to fifth. Having pitted early in the stage, Harvick had fresher tires than everyone in front of him. More good fortune came on lap 75 when an accident took out most of the competitors that had newer tires than the No. 4 car. Harvick restarted fourth on the overtime finish for Stage 3 and moved his way up to the front, winning his second stage of the race. Harvick stayed out during the last stage break and restarted the final 10-lap shootout in the lead. A caution on lap 91 set up another two-lap shootout to decide for a million dollars, with Daniel Suarez lining up below Harvick in second, Suarez’ teammate Denny Hamlin behind him and Joey Logano behind Harvick. With a push from Logano, Harvick was able to hold off the Suarez-Hamlin duo on the inside, bring home a victory and keep his hot streak going. 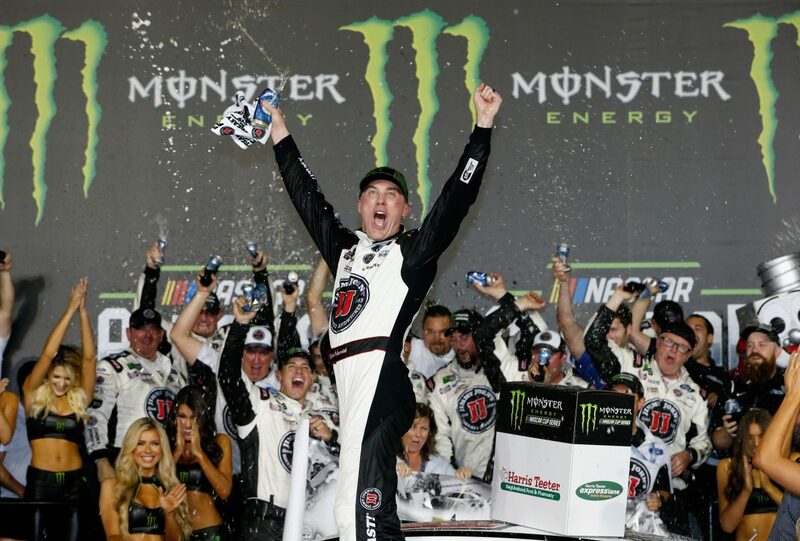 Harvick’s victory in the Monster Energy NASCAR All-Star Race marked the 50thoverall win for Stewart-Haas Racing (SHR). It was the organization’s third non-points victory in the NASCAR Cup Series to go along with its 45 points-paying NASCAR Cup Series wins and two NASCAR Xfinity Series wins. This was SHR’s second All-Star Race win. The first came in 2009 when Tony Stewart took the first win of any kind for SHR along with his first win in the All-Star Race. This was Harvick’s second victory in 18 career All-Star races. Harvick won the All-Star Race in 2007. Harvick’s margin of victory over second-place Suarez was .325 of a second. The All-Star Race featured 12 lead changes among seven different drivers. Twenty-one drivers comprised the field. Take us through the decision to start on the outside and hold on for the win. What are your overall thoughts on the aero package used for this race? The Monster Energy NASCAR Cup Series returns to points-paying racing on Sunday, May 27, with the Coca-Cola 600 at Charlotte. The longest race on the Cup Series schedule gets underway at 6 p.m. EDT with live coverage provided by FOX, PRN Radio and SiriusXM NASCAR Radio Channel 90.